Highlighted below are a number of the Artira's optional features. For additional optional features consult the Artira Design & Planning Guide or contact your local Garaventa Representative. The Side Load platform is designed for those lifts with confined lower landing areas. An additional side ramp allows the passenger to board the platform diagonally for easier access to the platform. The Artira can be finished with optional RAL colors, custom matched colors, stainless steel or painted stainless steel finishes. This feature will allow the platform to automatically fold if left unattended for a period of time at a landing. This ensures the stairway remains clear in the event someone forgets to fold the platform. An additional rail can be added to the system for pedestrian use. 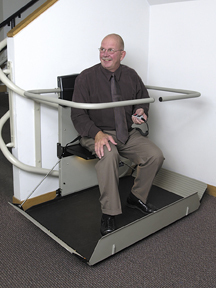 The folding seat enables semi-ambulatory or people with temporary injuries to use the lift. The Dek-Lite illuminates the platform for safe loading and unloading available only with the folding seat option. 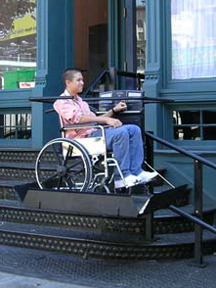 When the Stair-Lift is located outdoors, the Stainless Steel finish is required. For a comprehensive listing of stainless steel components consult the Artira Design and Planning Guide. An attendant would walk beside the Stairlift and operate the hand control. This system ensures the lift operates during a power outage. This battery-powered system provides power for one hour at a rated load. This lock secures the platform in its folded position protecting the unit from vandalism (not available on side load platform). This option is designed to interface with the building fire safety system, this service interrupts power to the lift when the alarm sounds. This ensures the lift will not obstruct stairway traffic during an evacuation. If the lift is in use when the alarm sounds, it will continue to a designated landing. The Audio-Visual Alert notifies pedestrians using the stairway that the lift is in use.